At the end of November, 2018, I spent a week in Grandview Heights, Ohio doing an art residency at Stevenson Elementary School. The residency was part of their 5 Columns project. 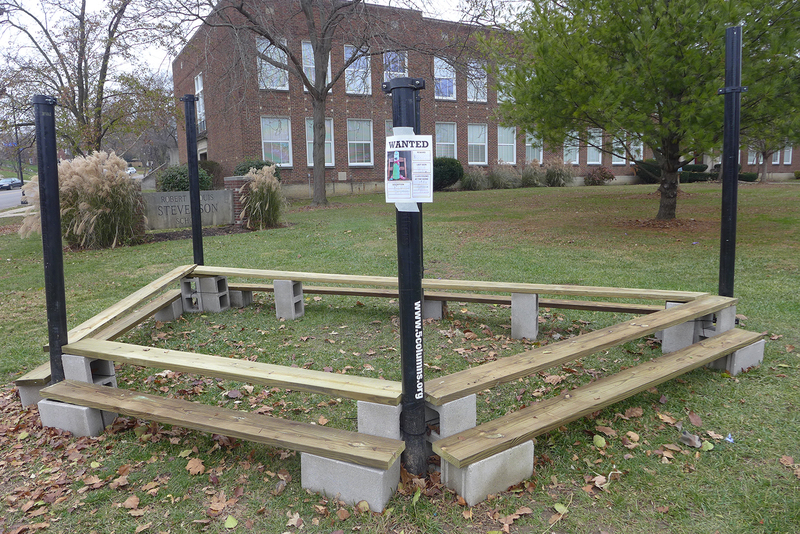 The 5 Columns are physical columns located on the school’s front lawn. Throughout the year, various artists visit and work with Stevenson students to create art that interacts with the columns in some way. The plan was for me to help four classes of Stevenson first graders (about 80 total students) construct individual fabric figures that would be seated on risers among the columns. The figures would be on display outdoors for two months, so we would use fabrics and sewing to make them sufficiently durable. 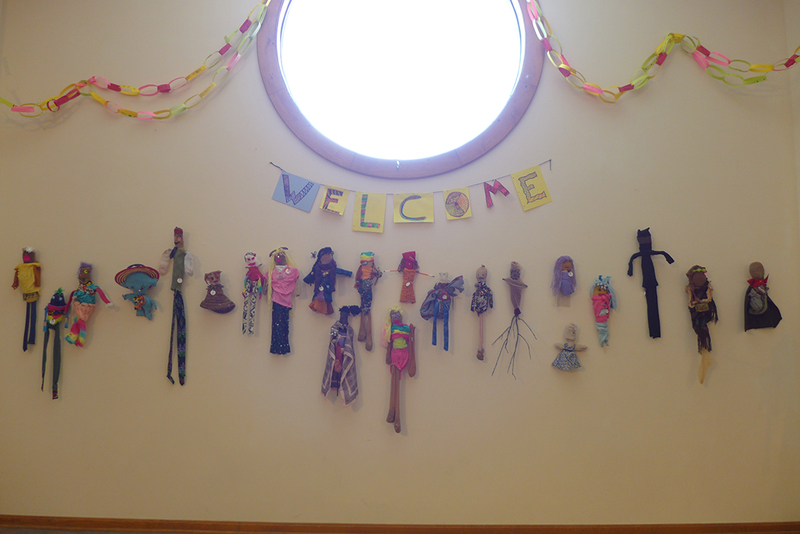 I began the week by showing the children my own figures and talking about the ways that I incorporated found fabrics and depicted emotions or memories. 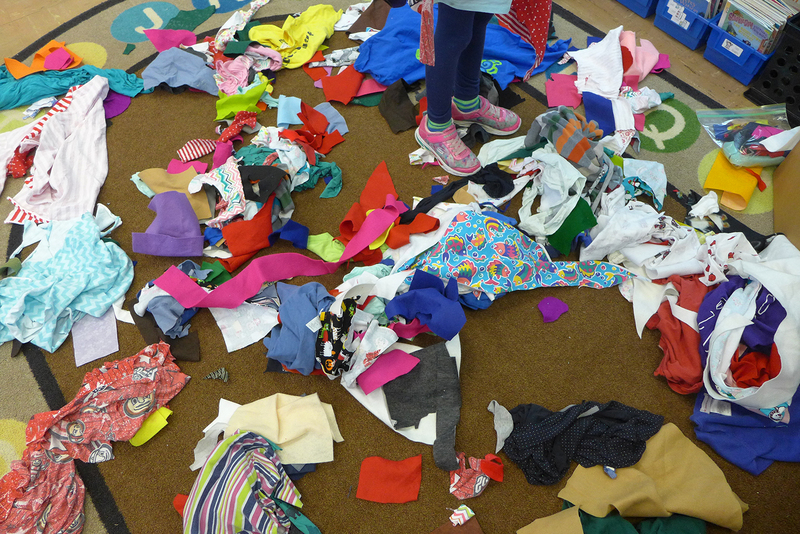 After that, the children began to construct their own fabric people. 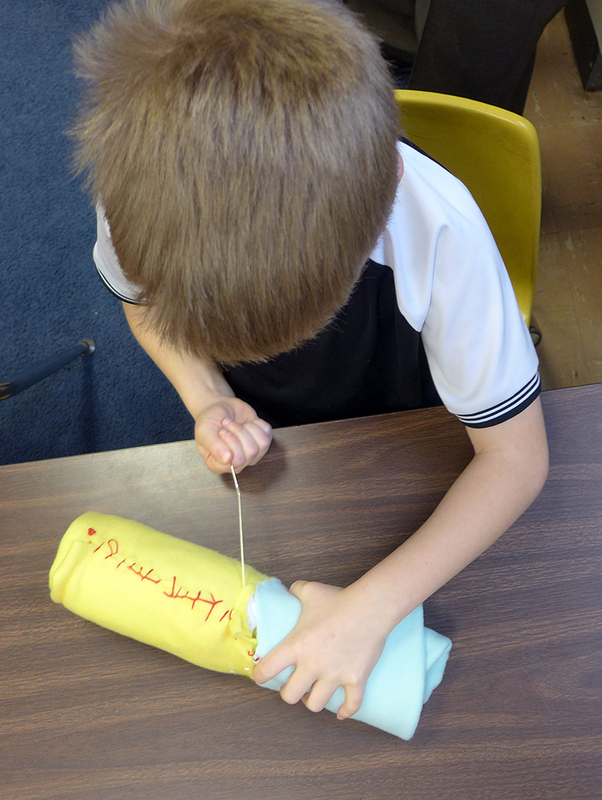 Quite a few of the first graders said that they had sewn before, but many were learning a new skill. 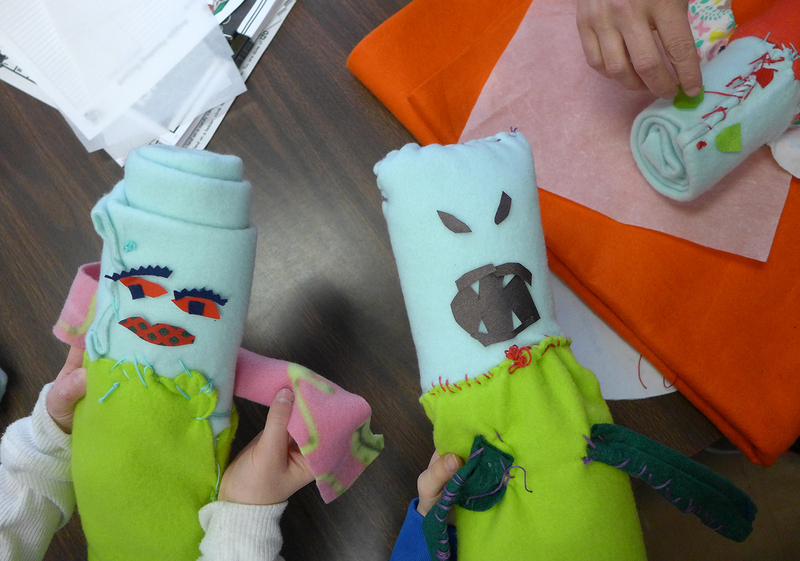 They learned how to control their needles and how to make stitches that would successfully join two pieces of fabric together. From the start, the entire group was very enthusiastic about sewing. They had a lot of fun and took pride in their work. I had hoped that they would enjoy it, but was blown away by their energy. 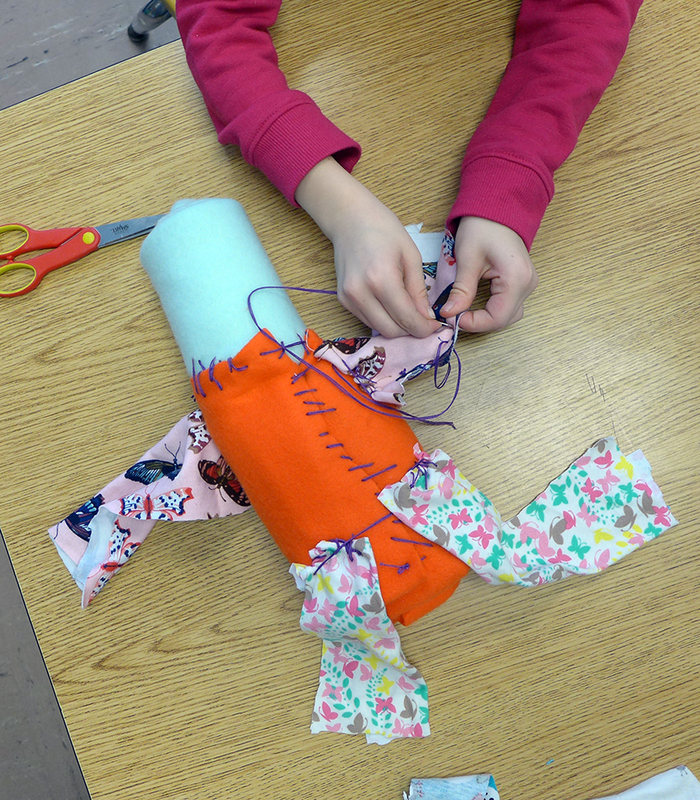 The first step was to learn to sew as they created the solid head and body that would form the core of each sculpture. Once that was complete, the students added arms and legs. 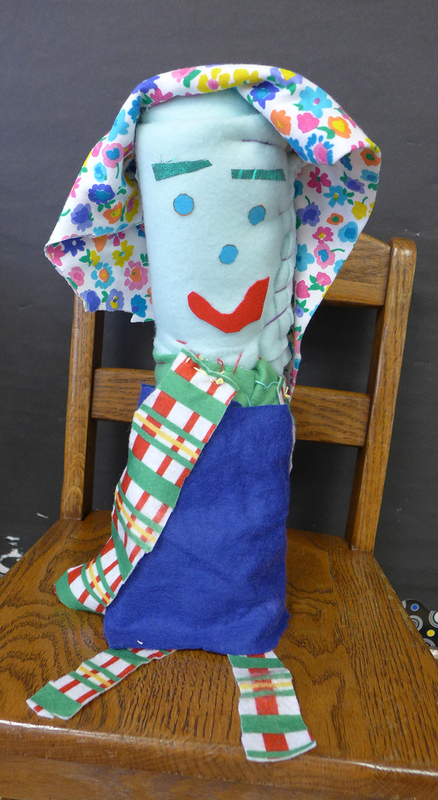 They chose the fabrics that they would use and used their own creativity to decide what the arms and legs would look like. Next, we added faces using iron-on fabric. Last came hair and additional accessories and clothing. Sewing the head and body to make a strong base. Lots of fabrics to choose from! Using iron-on fabric to create a face. A couple characters nearing completion. There was plenty of room for individual creativity and interpretation within the scope of the project. 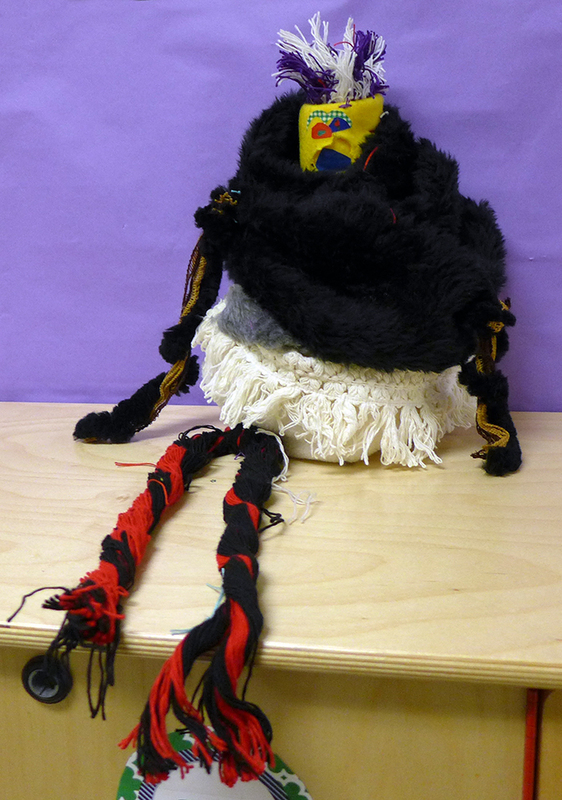 The students insisted that these were not “dolls” when one classroom visitor mistakenly identified them as such. Every morning I was excitedly asked multiple times whether we were going to get to sew again. Teachers and parents reported that the students were talking about the project at home and in their classrooms. A grouping of one class’ figures. 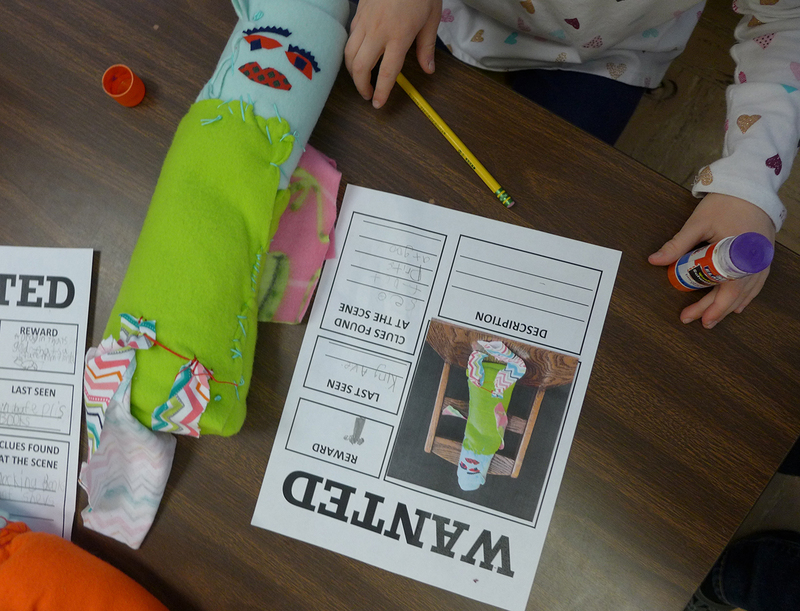 As we wrapped up the week, it became apparent that the first graders had connected with their fabric creations. They had given them names and personalities. 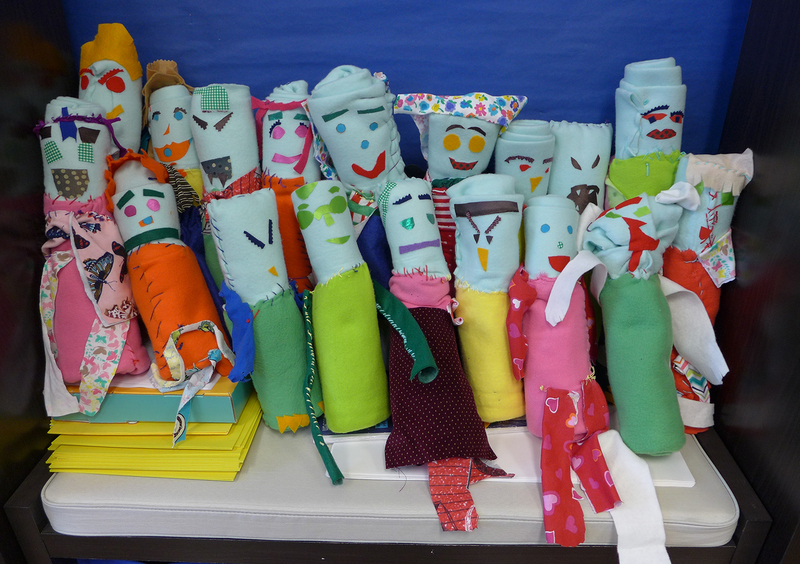 They gave their fabric figures hugs as they carried their artwork around their classrooms. The students were very upset by the thought of sending their creations outdoors to be displayed on the 5 Columns for two months. 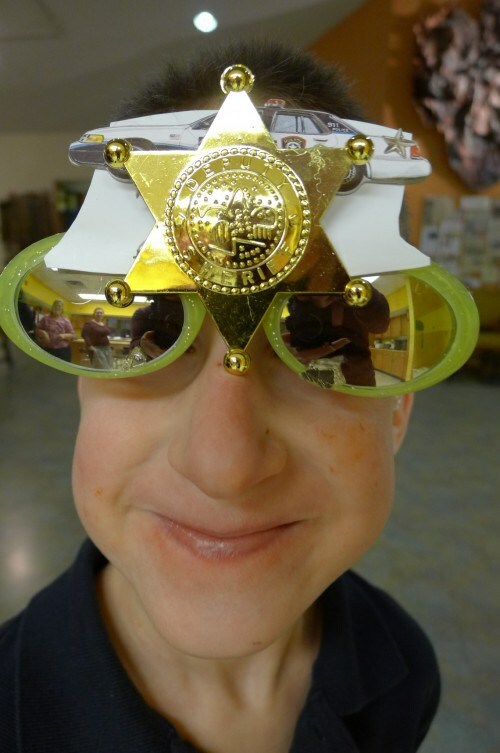 Fearing many tears and some artwork snuck home in backpacks, we changed course and asked the children to make “Wanted” or “Missing” posters for their sculptures. The posters would be stand-ins for the artwork, which would now be missing from the 5 Columns because it was at home with the children. I thought it was a wonderful solution, and I liked the fact that it turned the project into a piece of conceptual art. 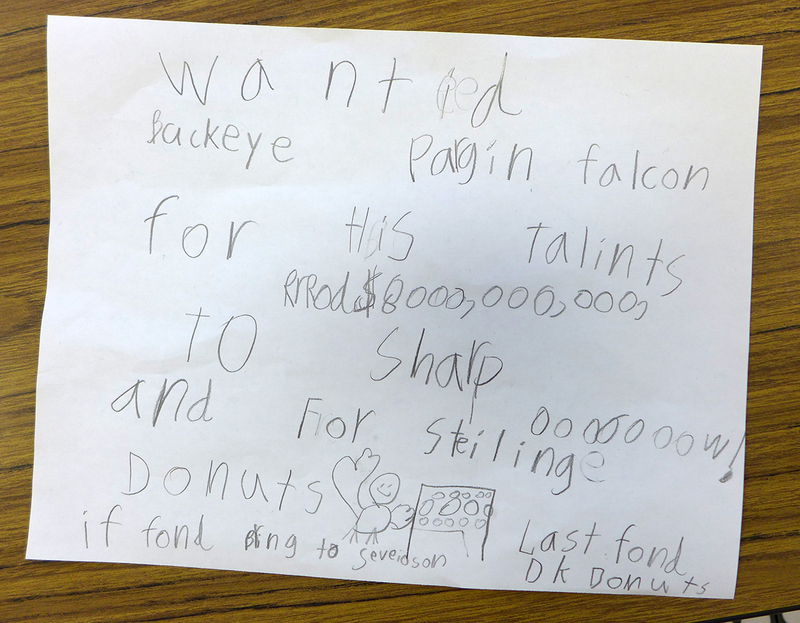 A student’s work brainstorming a wanted poster. One student creating a wanted poster for her creation. An example of a Wanted poster. 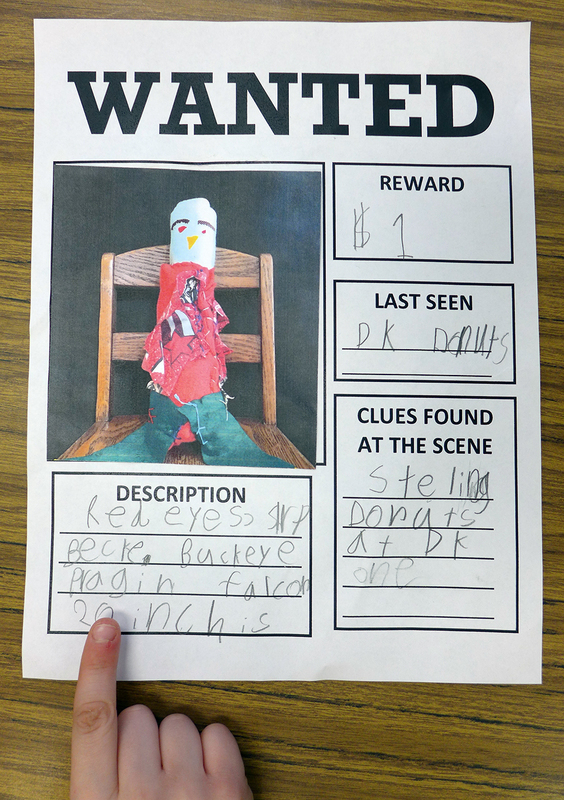 It was up to the students to determine if their figure was “wanted” or “missing”. The forms with their writing prompts were provided by the first grade teachers. A view of the 5 Columns with one Wanted poster attached. Note the empty risers where the artwork was supposed to have gone. 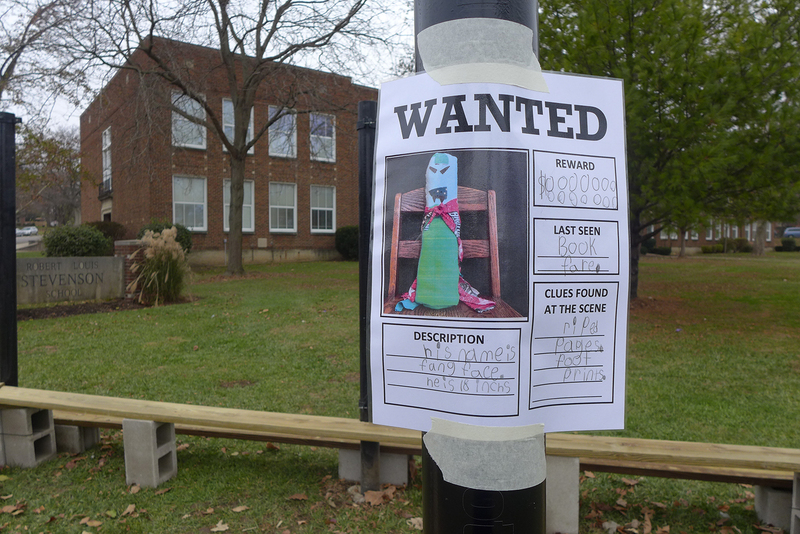 A closer view of the Wanted poster attached to one of the 5 Columns. 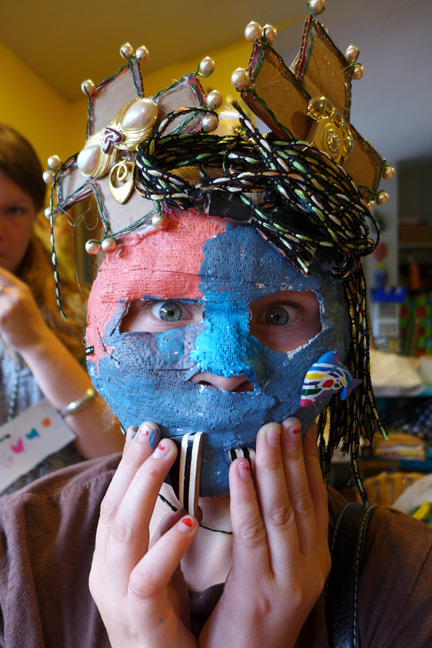 You can read more about the residency and the children’s “uprising,” plus watch a video of one of the young artists discussing his work by clicking here to read a story in the local newspaper. As part of our show in Jasper, Jane and I led a workshop for a group of local high schoolers. We talked about our art some and they looked at the show. Then we went to the workspace downstairs and made some art. We all constructed bundles of objects with the thought that they would be hung from a tree outside to weather. It was an idea that Jane and I had tried out earlier. I thought the kids came up with some great ideas and interesting construction techniques. In a way, we were manufacturing the kinds of objects that Jane and I collect from the street and other interesting places. 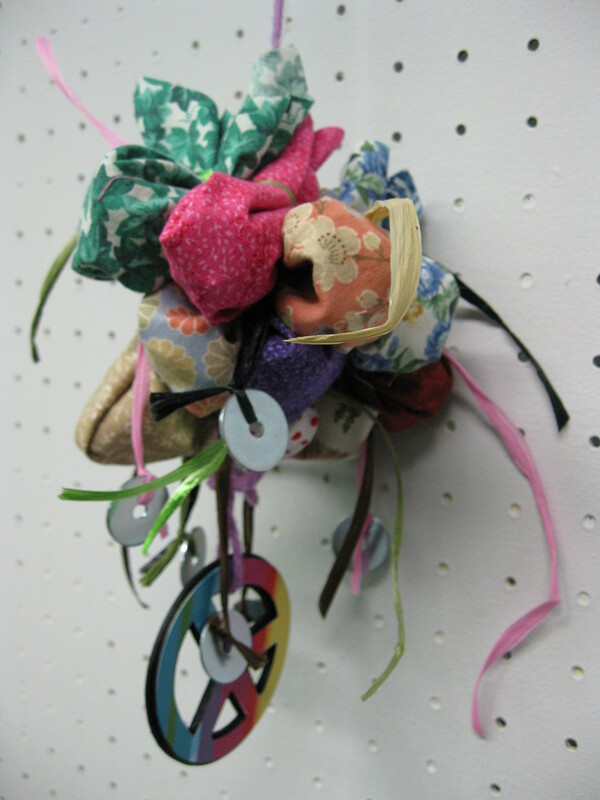 We provided a lot of odds and ends–fabric, paper, markers, thread, yarn, feathers, old toys, bolts, washers, pop cans, magazines, old Starbucks gift cards–even a Girl Scout cookie. 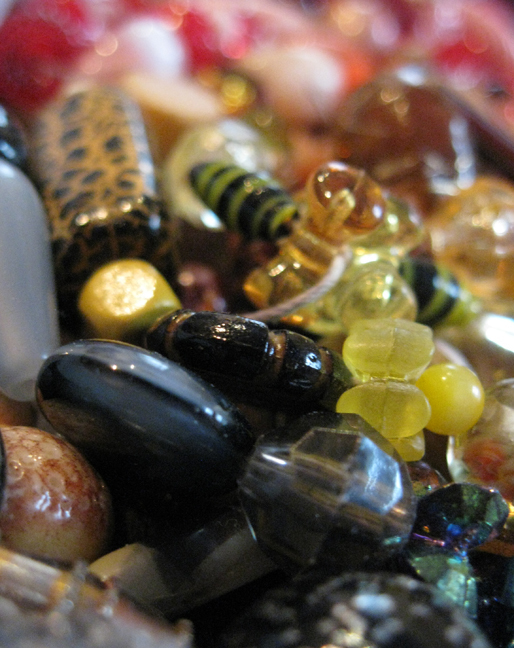 They were asked to bring some object that they found around where they lived, and some did. Above is one: a bundle of bundles. There was also one that made wings out of the Starbucks cards so it would spin. Several others got innovative with markers. Some even pulled the felt out of the inside of the markers and hid them at the center of their bundles with the thought that in the rain, the dye would seep out. The teachers said they’d hang the art up outdoors at the school. I hope they did and that Jane and I can see it when we go back to take the show down.